You’ve just received your permanent change of station orders and they say to pack up your entire life and move to the other side of the country. Your heart begins to race, your palms get sweaty, and you immediately begin to stress as you think about all the things you’ll need to do in the next few weeks and months. No matter if it’s your first, fourth or fifteenth move, every PCS is memorable in its own right, whether for good reasons or bad. You’ve heard the horror stories, especially if we’re talking about cross-country or overseas moves. But, while packing and moving can be an extremely stressful time in your life, it can actually be pretty memorable and, dare I say, fun if you follow a few of these tips. Regardless of what branch you serve, Joint Travel Regulations dictate everything about your military move pertaining to money and time. Buddy-up with your local move office. They will give you detailed instructions and checklists to ensure you, yourself, your vehicle, your grandmother’s china, and your vintage record collection safely wind up at your next duty station. Depending on how long your service member has before checking into his or her next command, determine the number of days you’ll need to travel and ensure you factor in a few days of wiggle room. The JTR will dictate specifically how many days you’re authorized to get to where you’re going and get paid for the costs you incur. Yes, you can drive from San Diego to Norfolk or Dover to Nellis in three days, but it’s definitely not fun or safe. Know how much time you have to burn, how much money you have to spend and when you’ll be traveling. Weather can often dictate if you take a northerly or southerly route. Know ahead of time so you avoid potential blizzard setbacks or hurricane delays. Depending on your route, pick places along the way that you want to visit. Perhaps make a theme of the places you want to visit and the things you want to see. Want a few lessons of American history? Never seen the Grand Canyon? Always wanted to visit the Big Easy? A cross-country PCS is the perfect time to knock these big items off your bucket list — and help you can make the trip fun! Take all the things you learned while you did your research and make a plan. Some people like to have every day mapped out: miles logged, lodging booked, and tours planned. Others prefer a more laid-back approach. 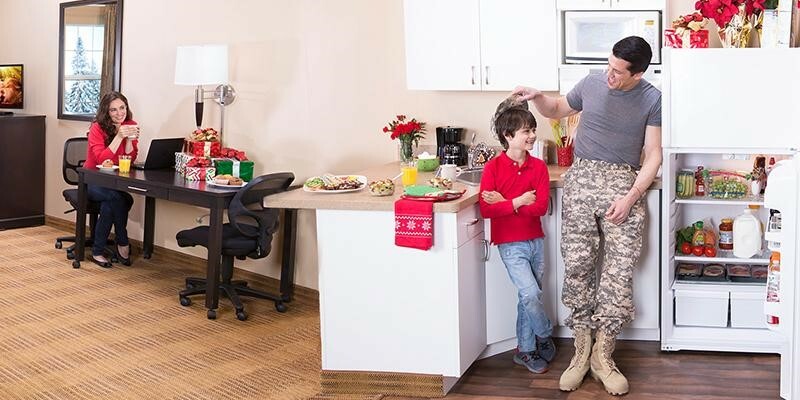 Whatever your style, Extended Stay America is the military family’s PCS dream. If you’re planning every detail or going on a whim, Extended Stay America has over 600 locations across the country. And with pet-friendly accommodations equipped with a full-size kitchen in every room, laundry, and free wi-fi all at a mid-level price point, you and your traveling clan will want to book each night of your trip at the closest Extended Stay America on your route. Nothing can kill a mood faster on a road trip than eight hours of watching the pavement whiz by. If you’re toting little ones along, pack special “PCS Packs” for each day with little, Dollar Store activities, snacks, games, and treats. If it’s just you and your ride-or-die partner, plan some activities like Bingo or a scavenger hunt. And of course, nothing helps pass the hours better than a killer road-trip playlist. Having fun stops planned will give you something to look forward to as you get closer to your final destination. Remember to rest as well. Driving all day for days on end can get monotonous and take a toll on your body. Whether you’re snapping photos to Tweet, post on Facebook, Snapchat or Instagram, throw a hashtag on your posts and images. #SmithPCS2018 or #BraggtoBliss2018 will categorize your photos and allow your followers to join you on the road. Use Facebook as a microblog to document your trip. Or, if you’re old school, gather things along the way to put in a scrapbook. Visitor centers are awesome for things like this because you can usually grab pamphlets, maps, and flyers for free. Check the lobby of your Extended Stay America too, as they might have resources for local attractions. It wouldn’t be a military PCS if at least one thing didn’t go awry. Whether it’s a missed hotel reservation, a flat tire, or bad weather, Murphy’s Law always prevails and something will go wrong. But, military families are experts in resiliency, so flex your plans, embrace the chaos, and add it to the memory books. There are a few facts of life when it comes to a military lifestyle, regardless if you’re single or have 10 children. The likelihood of moving at least once in your career is pretty high. And while a cross-country move can elicit big life changes and emotions, there are ways to make it not only memorable, but fun. Start every day with free grab-and-go breakfast from your Extended Stay America, hit the open road and see cool things along the way. The key factor, though, as with all things military, is to do what works for you and you’ll be sure to arrive at your next duty station ready to make it your new home. Does the Gig Economy Really Work for Military Spouses?